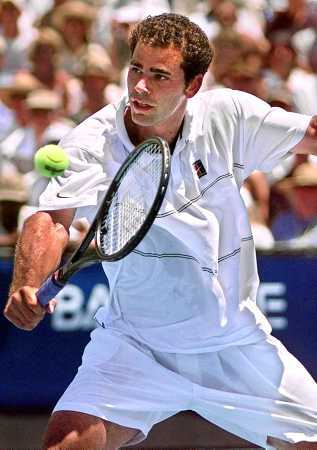 Petros "Pete" Sampras (born August 12, 1971) is a retired American tennis player and former World No. 1. During his 15-year tour career, he won 14 Grand Slam singles titles. 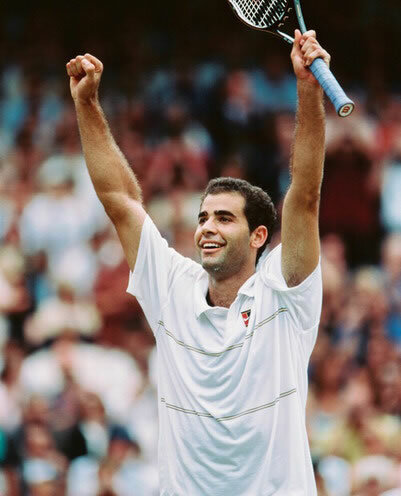 Sampras debuted on the professional tour in 1988 and played his last top-level tournament in 2002 when he won the US Open, defeating rival Andre Agassi in the final. He was the year-end World No. 1 for six consecutive years (1993–1998), a record for the open era. His seven Wimbledon singles championships is a record shared with William Renshaw. He spent 286 weeks at number 1, the most of any player. His five US Open singles titles is an open-era record shared with former World No. 1 players Jimmy Connors and Roger Federer. He won five ATP World Tour Finals a record shared with Ivan Lendl and Federer. Sampras is the last American male to win Wimbledon (2000) and ATP World Tour Finals (1999). He is widely regarded as one of the greatest tennis players of all time. Pete Sampras was born in Potomac, Maryland, and is the third child of Sammy and Georgia Sampras. His mother immigrated from Sparta, Greece, and his father was born in the United States to a Greek immigrant father and a Jewish mother.Greek culture played a big role in his upbringing. Pete attended regular services of the Greek Orthodox Church on Sundays. From an early age, Sampras showed signs of outstanding athletic ability. At age 3 Sampras discovered a tennis racket in the basement of his home and spent hours hitting balls against the wall. In 1978, the Sampras family moved to Palos Verdes, California, and the warmer climate there allowed seven-year-old Pete to play more tennis. From early on, his great idol was Rod Laver, and at 11 Sampras met and played with him.The Sampras family joined the Jack Kramer Club, and it was here that Sampras's talent became apparent. He was spotted by Peter Fischer, a pediatrician and tennis enthusiast, who coached Sampras until 1989. 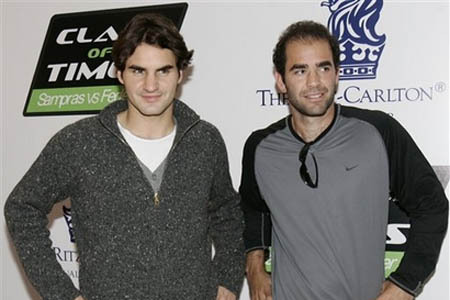 Fischer was responsible for converting Sampras's double-handed backhand to single-handed with the goal of being better prepared to win Wimbledon. 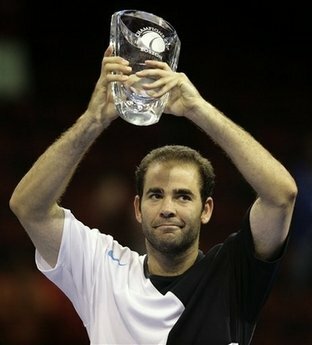 Sampras was an all-court player who would often serve and volley. In the early years of his career, when not serving, his strategy was to be offensive from the baseline, put opponents in a defensive position, and finish points at the net. In his later years, he became even more offensive and would either employ a chip-and-charge strategy; just chip back the return and run up to the net, waiting for a volley or try to hit an offensive shot on the return and follow his return to the net. He was known for producing aces on critical points, even with his second serves.He had an accurate and powerful first serve, one of the best of all time. His second serve was nearly as powerful as his first, possibly his most dangerous weapon. He had great disguise on both his first and second serves. Sampras was able to hit winners from both his forehand and backhand wings from all over the court. He was also especially known for having arguably the best "running forehand" of all time. He was able to catch attacks wide to his forehand using his speed and hitting a forehand shot on the run. When successfully executed, he won many points outright or put opponents immediately on the defensive, due to the extreme pace and flat nature of the shot. He also popularized the jump smash, or "slam dunk", where he jumps and then hits the smash in mid-air. The nearest Sampras came to having any weakness in his arsenal was his backhand. Many players tried (especially late in his career) to serve a high "kicker" out to the Sampras backhand in an attempt to draw a weak return. A similar tactic was employed by many players in rallying Sampras; they would play shot after shot to the Sampras backhand, hoping to wear him down. Still, most of the time, he will handle them with either topspin or slice backhand deep to his opponent's court to change defense to attack.